If you own your own restaurant and love to serve food, are you really happy to reach out to people by traditional way? Technology has brought a great change in the present age. So step into era of technology and offer your menu within their comfort zone. Online food ordering system is the trend that has taken over the restaurant industry. In fact Food serving industry has become very competitive these days. Now all restaurateurs offer very attractive deals and offers to lure customers. If you really want to be successful restaurateur, you have to stand out of the crowd. And online food ordering system will do this for you. Having a website is basic needs for most of the businesses today and food serving industry is one of them. According to a recent study 39% of consumers have ordered food online. A research says that online food ordering system has increased 40% on average sell of restaurants. So mobile apps and websites has become shortcut to success these days. If you really want to boom your restaurant’s revenue, you must implement online food ordering system in your restaurant. Here are some reasons why online food ordering system is commercially beneficial for your business. Can serve to all - Usually restaurateurs doing offline business have maximum risk to lose customers in case tables are full. But with the help online food ordering system table restrictions are not going to affect your revenue. You can now serve to as much customer as possible. Real demand - A research says that, 39% of users prefer to order food online. So if your menu is not visible online, you miss the chance to attract those 39% of users. 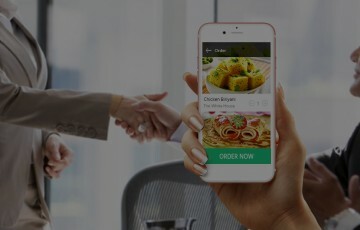 Global access - Without online food ordering system, you are serving to only those people who know the address of your restaurant. What about those who don’t know your address or living in different locality. How can they access your menu? That’s right; they can access your menu via mobile apps and websites. Stay in competition - In today’s world, where every business has become competitive; never lose any single customer to your competitor. And you will be able to do this only if you have blocked all the exit points. Full profit - All the revenues made by the transaction through the app belongs to you. There is not any middle man or any fee you have to pay. So enjoy cent percent profit with mobile apps. Coupons - Coupons are new trend in online ordering system these days. With the help of mobile apps, you can lure your customer with attractive offers and coupons which leads to more revenue. Delivery at door step - Most of people don’t have time to go to restaurant and have food. If you offer food delivery at their door step through mobile app, they can resist themselves to order. Social Sharing - sharing positive experience on social media is a great way to advance words of mouth and social proof around your business. It will boost your reputation, and you will witness more revenue afterwards.